Chatham is located at the “elbow” of the Cape - - the point where the Cape bends northwards. Although it is far from the mainland, the real estate here is some of the most expensive on the Cape. The reason for this being that it is a charming town with classic New England architecture, tree-lined streets and nearby beaches. We stopped near the main street of Chatham and were given two hours of free time. This was to allow the participants to have something to eat at one of Chatham's restaurants or to visit the small shops along Chatham's main street. Considering the abundance of food on the ship, having another meal was not a high priority for me so I set out to explore the town. Chatham's main street is a pretty street. With its classic churches, small shops and tree-shaded sidewalks it looks like a traditional New England town. Armed with a map app, I left the main street and proceeded in the general direction of the sea. I did not make it there but along the way, I encountered a picturesque tidal pond and a windmill built in 1797. All along the streets, the flowering trees were in bloom. When the tour group again gathered, the bus took us to see Chatham Lighthouse. The waters off Cape Cod are quite treacherous with shifting shoals. As a result, there were numerous shipwrecks off the Cape in the 18th and early 19th centuries. Indeed, there were more than 3,000 shipwrecks in the 50 mile stretch between Provincetown and Chatham. Therefore, a network of lighthouses were constructed on the Cape to aid ships in navigation. My great grandfather was a lighthouse keeper on the Cape after he retired as a sea captain. In 1808, President Thomas Jefferson authorized a lighthouse at Chatham, the second lighthouse on Cape Cod. The lighthouse you see today is not the original lighthouse. There were three other structures here prior to this one but they had to be replaced due to weather and erosion. The current lighthouse was built in 1857 and is made of cast iron. To distinguish it from the first Cape Cod lighthouse, Highland Light, the Chatham Lighthouse was built with two light towers and was long known as Twin Light. In 1928, the second tower was removed and moved to Eastham because it was felt that two lights were no longer necessary at Chatham. 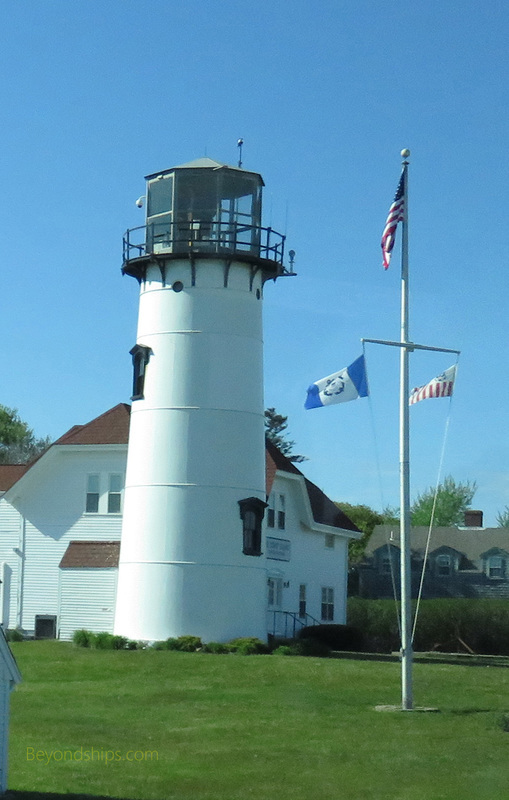 The Chatham Lighthouse remains an active lighthouse operated by the U.S. Coast Guard. I was disappointed that we only paused at Chatham Lighthouse rather than make a full stop. In addition to the lighthouse, there is a beautiful stretch of beach that would have been interesting to explore. Perhaps less time should be spent in Chatham town itself in order to make a stop here possible. Overall, I enjoyed this tour. We saw several beautiful places with some interesting history. As noted earlier, there was not enough time to do everything and see everything, but I felt that the tour provided a taste of several diverse experiences that can be had on the Cape.